We are going to need a lot of popcorn to watch the show in Congress for the next two years. Open Democrat-Socialist Rep. Alexandria “Sandy” Ocasio-Cortez called for a 60%-70% tax rate on Friday. Hold on to your wallet, there has been a change in Washington. The Washington Examiner posted an article today about a recent policy change from the Federal Energy Regulatory Commission. The Federal Energy Regulatory Commission (FERC) issued a proposed rulemaking that would require all publicly-owned utility companies that own transmission lines “to revise” their rates to account for the benefits they received under the tax reform package. The tax reform bill passed last December cut the corporate tax rate from 35 percent to 21 percent beginning in 2018. A number of states’ energy commissions have already directed the utilities they regulate at the retail level to account for the changes and grant credits to ratepayers. …FERC also issued a policy statement on Thursday that provided ratemaking guidance for all companies under FERC’s jurisdiction to account for the tax benefits they received. Those companies include public utilities, owners and operators of natural gas and oil pipelines. FERC also acted on 46 show-cause investigations, directing certain public utilities whose transmission tariffs used a tax rate of 35 percent to reduce their tax rates to 21 percent, or show why they did not need to do so. As much as I generally don’t like federal regulations, if that is what it takes to pass the tax savings of publicly-owned utility companies on to their customers, then I support the regulations. Yesterday Breitbart posted an article about one of the unexpected side effects of the Trump tax plan recently passed by Congress and signed by the President today. The challenge to Congress will be to make sure that the extra money flowing into government coffers because of the changes in the tax law will be used to pay off the debt–not to increase spending. The first fact to remember about the Republican tax plan is that what is eventually passed by Congress will be different than what was introduced today. How different we don’t know, but it will be different. The Daily Signal posted an article today highlighting some of the proposed plan. The plan would simplify taxes, lower income tax rates, and positively impact business taxes. The tax reform package would simplify and lower the current tax rate structure, from seven different rates ranging from 10 percent to 39.6 percent, to four rates: 12 percent, 25 percent, 35 percent, and 39.6 percent. Most low- to middle-income earners would face lower marginal tax rates, which would help encourage more work and also put more money back into taxpayers’ pockets to spend more productively than the federal government. Unfortunately, the plan maintains the top marginal rate of 39.6 percent (which reaches 43.4 percent when factoring in the Obamacare surtax). While only 1 of every 150 taxpayers actually pays the top rate, more than 1 of every $5 of taxable income is subject to that tax rate. That means a lot of economic activity is affected by the top rate, and lowering it would have a significant and positive impact on investment, productivity, incomes, and job growth in the U.S. Maintaining a high top rate for wealthy Americans may make the plan more politically palatable, more appealing to average Americans, and help reduce the alleged “costs” of the tax reform plan. In reality, though, it would not result in nearly as much revenue as static estimates project, and it would limit the plan’s ability to maximize job growth and boost incomes for everyday Americans. One aspect of the tax plan that is going to meet with a lot of resistance is the change to state and local tax deductions. The proposed tax plan would partially eliminate state and local tax deductions by getting rid of the deduction for income or sales taxes, and by capping the deduction for property taxes at $10,000. State and local tax deductions provide no economic benefit. In fact, they are outright detrimental to the economy. By allowing those who itemize their taxes to deduct property taxes as well as income or sales taxes they pay to state and local governments, these deductions shift the burden of high-tax states onto low-tax states, and spread a portion of high-income earners’ taxes onto lower- and middle-earners’ tax bills. For example, just seven states (California, New York, New Jersey, Illinois, Massachusetts, Maryland, and Connecticut) receive more than 50 percent of the value of the state and local tax deductions. And on net, the average millionaire receives 102 times as much benefit from the state and local tax deductions as a typical household that makes between $75,000 and $100,000. Eliminating the sales and income tax deductions would be a huge benefit to at least 85 percent of Americans. Please follow the link above to read the entire article. It explains how each part of the tax plan would impact families in all income brackets. What we are hearing in the mainstream media is not necessarily accurate. The federal government brought in a record of approximately $213,300,000,000 in individual income tax revenues through the first two months of fiscal 2017 (Oct. 1, 2016 through the end of November), according to the Monthly Treasury Statement released today. That is approximately 36 times the $5,966,000,000 the federal government brought in from customs duties imposed on foreign imports over the same two-month span. In constant 2016 dollars (adjusted using the BLS inflation calculator), the record $213,300,000,000 in individual income taxes the Treasury raked in during October-November of this year was up $6,432,550,000 from the $206,867,450,000 it brought in October-November of last year. 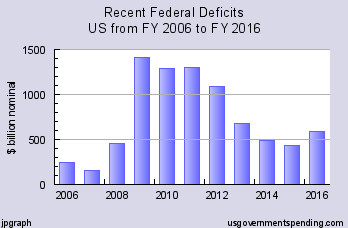 The tax revenue is going through the roof and the deficit is rising. Would you run your household budget this way? Today’s New York Post posted an article about the impact of Mayor de Blasio’s proposed tax policies. 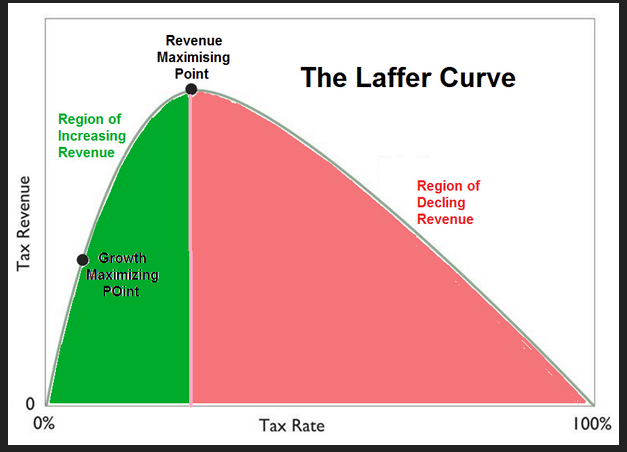 Below is the Laffer Curve. It represents the fact that there is a point where you raise taxes to the point that revenue decreases. There are many reasons for this–people find ways to shield their money from taxes, people relocate to places with lower taxes, and people make a decision to earn less so that they will be taxes less. At any rate, there is a tipping point. It remains to be seen if New York City has reached it. When he ran for office in 2008, President Obama promised not to raise taxes on any family that earned less than $250,000. Then candidate Obama stated, “I can make a firm pledge. Under my plan no family making less than $250,000 a year will see any form of tax increase. Not your income tax, not your payroll tax, not your capital gains taxes, not any of your taxes.” (from Townhall.com) Well, I guess that promise has been added to the list of broken promises. Today, Heritage.org posted a story about tax increases that occurred in 2013 and tax increases planned for 2014. Obamacare’s individual mandate. Beginning in 2014, it’s mandatory to purchase health insurance. If you don’t, you’ll pay a penalty that dramatically increases over time. It starts at $95 or 1 percent of your income (whichever is greater). It rises to $325 or 2 percent of income in 2015, and $695 or 2.5 percent of income in 2016. Obamacare tax on insurance companies. If you liked seeing your premiums go up, you’ll love this new tax on health insurers—which they are most likely to pass on to you. The article also posted a list of the 2013 tax increases. The Social Security payroll tax for workers went from 4.2 percent to 6.2 percent for everyone–regardless of whether or not they earned $250,000. Also increased were various taxes on high earners–marginal tax rates increased, deductions decreased, investment taxes increased, and inheritance taxes increased. Excuse me for being totally politically incorrect here, but keep in mind that taxes on people who do not work but collect welfare or other government handouts did not increase. Keep in mind that when you tax an activity it decreases, and when you don’t tax an activity it increases. These kinds of tax increases do not encourage economic growth–they stifle it. President Obama promised the American people a “balanced approach” of tax increases and spending cuts to reduce deficits and debt. He achieved the tax increase portion of that approach. Now Congress needs to force him to follow through on the spending cuts. Until we see spending cuts, the economy will continue to grow much more slowly than it is capable of growing. The combination of high taxes and over regulation by the government is the biggest obstacle to a much needed economic recovery. I live in Massachusetts. I don’t plan to live in Massachusetts too much longer as my husband will be retiring at the end of this year, and the Massachusetts tax structure does not make retirement here a reasonable option. Real estate taxes are high, the temporary increase in the rate of the state income tax has been with us for more than twenty years, and if the current governor has his way, things will only be getting worse. Today’s Boston Globe posted an editorial by Barbara Anderson, executive director of Citizens for Limited Taxation. The article is entitled, “Manage money from previous tax hikes first.” That pretty much says it all, but she goes on to explain what she means. In 1989, Governor Michael Dukakis returned from the presidential campaign trail and demanded tax hikes to fund a billion-dollar budget increase; supporters rallied at the State House, some of them dressed as giant crayons, to protest potential cuts to the arts. The legislative leadership was able to get the votes for the tax package only after promising that the new income tax rate, increased from 5 percent to 5.75 percent, would be temporary. The Legislature raised the rate again the next year, “temporarily,” to 6.25 percent. …Instead, in 2011 a formula created in 2002 dropped the rate to 5.25 percent, where it remains — 24 years after the first “temporary” increase, and 12 years after the voters demanded a rollback to 5 percent. The Massachusetts tax burden is the fourth highest in the nation per capita, eighth highest relative to personal income. The state is not suffering from a lack of taxes; it is suffering from a lack of accountability for the taxes already paid. The ongoing scandal over electronic-benefits cards is a maddening example of this. I think taxpayers in the Commonwealth of Massachusetts might be a little less grumpy about their tax rate if we didn’t routinely see stories about the Commonwealth’s waste of taxpayer money. Part of that waste is due to the fact that politicians like to spend other people’s money, but another part is the fault of the voters who keep electing the same people year after year. Until someone holds the Massachusetts legislature accountable, they will continue to be out of control. It also would help to have two viable political parties in the Commonwealth, but that may be a pipe dream! Somehow, when the story was reported, the headline read, “Americans Back Obama Tax-Rate Boost Tied to Entitlements.” So what did the poll actually show? The article reported that fifty-eight percent of the people polled thought President Obama was right to insist on raising taxes on the wealthy as a precondition for talks about the fiscal cliff. However, when you take a closer look at the numbers, you find that fifty-two percent responded that they preferred limited tax breaks to a tax-rate hike. Thirty nine percent said that they wanted to see tax rates on the wealthy increase, and nine percent said they were not sure. Please follow the link above to read the entire story. There is also an attempt in the story to convince the reader that raising taxes to increase government spending is a solution to our current economic problems. Bloomberg news is a respected financial news source. They do a disservice to themselves and the American people when they do not accurately report the news..
On Saturday the Washington Examiner posted an editorial about balancing the American budget. The editorial reminds us that everyone–rich or poor–will pay more in taxes after January 1. Liberal columnists love to point out that the top marginal rate on personal income was 91 percent in the 1950s and in the early 1960s. But the tax code back then was also chock-full of loopholes and benefits that let top earners escape such stifling tax burdens. 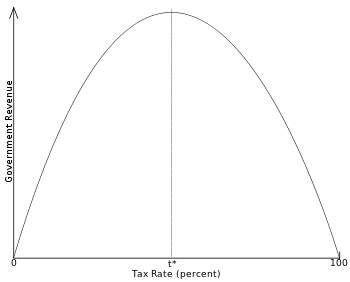 As high as top marginal rates were, taxes as a percentage of GDP never rose above 19 percent, and in fact fell as low as 14.5 percent. In fact, since World War II, federal taxes as a percentage of GDP have never risen above 20.6 percent and have averaged just under 18 percent. This has been consistent, regardless of changes to tax rates. Obama’s favorite think tank, the Center for American Progress, submitted a plan that calls for the federal government to eat up more than 20 percent of the American economy through taxation every year, in perpetuity. Being the liberals that they are, CAP calls for even higher levels of spending — above 22 percent of GDP by 2022 alone. Contrast CAP’s plan with that of the Heritage Foundation. It returns taxation to just above the historical U.S. average at 18.5 percent of GDP. By cutting spending to pre-Great Society levels, the Heritage plan not only balances the budget but actually begins to lower our cumulative national debt. Taking money from people who earn it and giving it to people who don’t earn it is not a solution to anything. Until Washington stops using American taxpayers as vehicles to get re-elected, nothing will be accomplished. 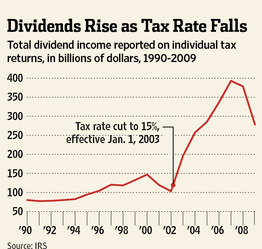 The chart shows what happens when taxes on dividends is raised. The editorial that goes with the chart goes into the details of why this happens. Please follow the link to read the details. The chart was posted in response to President Obama’s proposal to raise taxes on dividends from today’s rate of 15 percent to 39.6 percent, actually 41 percent after the phase out of deductions and exemptions, and a 3.8 percent surcharge, giving you an effective rate of 44.8 percent. The new rate would only apply to those making over $200,000 a year (individuals) or $250,000 (couple). Exactly who would be impacted by this increase in the dividends tax? Actually, senior citizens would be hardest hit (yes, that is one of many reasons I am up in arms about this!). 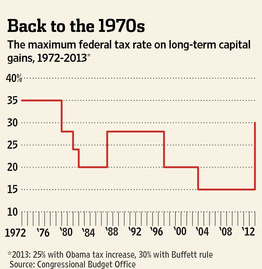 As you can see from the graph, when the tax rate on dividends goes down, corporations pay more dividends. Many senior citizens live on their dividends–if dividends decrease, their income decreases. Paying fewer dividends also devalues stocks–thus impacting everyone’s stock portfolio or 401k plan. Everyone loses. Seldom has there been a clearer example of a policy that is supposed to soak the rich but will drench almost all American families. We need to stop worrying so much about soaking the rich and worrying more about making tax policy that allows everyone who works hard to become rich!